How I started wegg® to help women entrepreneurs and business owners expand their businesses internationally. In 2008, I started a blog, Women Entrepreneurs Grow Global™, to help women entrepreneurs and business owners expand their businesses internationally. Based on experience, I knew that women who run businesses are less likely to trade internationally than those owned by men. I wanted to change the landscape for women from being risk-averse to having confidence to go for it—with the appropriate support. And that’s how wegg was born, which I’ll tell you more about in a bit. First, though, let’s take a look at the hard truths about women in international trade. There isn’t a shortage of women business owners. There are 163 million women business owners spanning 74 economies, according to the Global Entrepreneurship Monitor (GEM) Report for Women 2016/17. In the United States alone, there are more than 12.3 million female business owners, according to WBENC’s 2018 study. While women business ownership has been lauded, international expansion is a whole different story and tends to be misunderstood and gravely overlooked. Experts say that even women who support trade policies need better data to determine what’s going on in this growth area. To succeed in today’s economic climate — and beyond — it’s more essential than ever for women business owners to be informed and inspired to grow global. Thanks to the internet, even the smallest producer of goods and services can go global today, which allows for fast, breakthrough growth provided a business owner has know-how. Yet it’s just not happening. “Approximately 30 percent of businesses are women-owned, but only 12 percent of businesses that export are owned by women,” reports The United State of Women. That has to change. In its initial years, wegg was an educational website on which I regularly shared important resources so women interested in growing their customer base and revenue through exporting had a one-stop resource. I decided to expand wegg’s capabilities beyond a static website because of the low percentage of women business owners exporting and seeing firsthand the economic benefits of exporting on the economic health of the U.S. and other countries. The goal was to strengthen women’s participation in the global economy and break down barriers preventing women from expanding their enterprises through exporting. Since many of wegg’s services are aimed at emerging SMEs that lack resources and are unable to pay for continuing education, I incorporated the organization as a 501(c)(3) nonprofit in June 2015 and now serve as its president. To date, we have helped more than 1,600 women business owners and entrepreneurs start and quickly expand a business internationally. 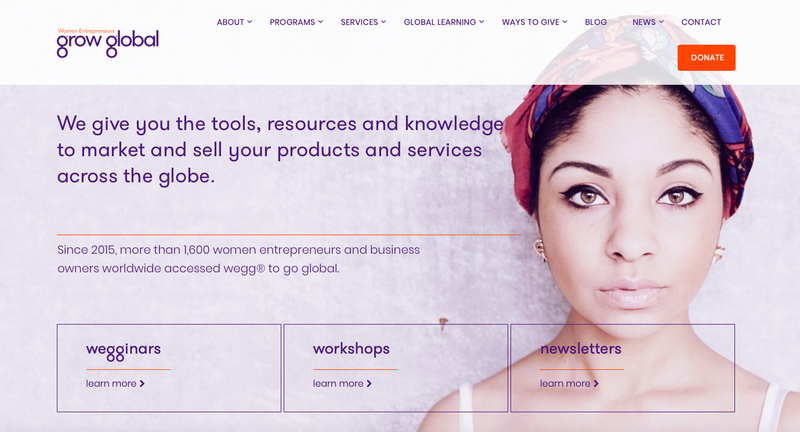 wegg meets its mission and vision by providing women-owned SMEs worldwide with tuition-free online education that walks them through the practical aspects of exporting and provides them with concrete strategies for global entrepreneurship. Relying on sponsorships, small grants and individual gifts has enabled wegg to power our current programming. Make no mistake: We don’t just connect millions of women entrepreneurs to each other in the global marketplace. We educate each woman business owner on how to take a business global – essentially giving her the tools, skills, confidence and inspiration she needs to run a healthier business and create a new future for herself, her family and her community. Our series of free interactive wegginars® and weggchats™ offer guidance on a variety of topics to help women entrepreneurs master the processes required to export successfully. Our quarterly on-the-ground wegg workshops unlock export potential in each person’s business. These programs are taught by subject matter experts, both practitioners and academicians. They help make exporting as easy, affordable and engaging as possible for women who are starting or growing their businesses, no matter where in the world they are located. wegg helps women-owned businesses develop the confidence to overcome structural and social barriers to exporting by showing participants how to defeat perception barriers, be more risk-oriented, foster an atmosphere of innovation, find mentors and be proactive. It provides its education services in a supportive, enabling environment for women entrepreneurs and women business owners so they can easily access global know-how. Soon we will see more women business owners and entrepreneurs trading internationally, exporting, importing and sourcing — creating a sky-is-the-limit mentality for women the world over who are built to export and ready to take on the world. wegg is proud to start and be a part of this essential women’s export movement. Laurel Delaney is the founder of GlobeTrade.com, creator of the Global Small Business Blog (globalsmallbusinessblog.com), Director of the Global Small Business Forum (globalsmallbusinessforum.com), President of Women Entrepreneurs Grow Global (womenentrepreneursgrowglobal.org), author of the best-selling, “Exporting: The Definitive Guide to Selling Abroad Profitably" (2nd edition, 2016), and Chicago Chapter Chair for the Women Presidents' Organization.